Caption slip reads: "Photographer: Snow. Date: 1956-03-02. Reporter: J. Massard. Assignment: Motorama. 43-44: Louise Hyde tries out the 'Golden Rocket', Oldsmobile dream car. 1-2: Actress Melissa Weston sits in Buick's dream car, Centurion, which has a cantilevered steer-column and a dashboard TV which shows traffic in rear. 29-30: Betty Bridgers with GM's experimental Firebird II, with kerosene-burning, gas-turbined engine and automatic steering. 35-36: Barbara Anne Rolf in cutaway of Chevrolet Bel Air. 33-34: Lef to right -- Sue Murray and Doris Du Shane enjoy themselves at world's largest (50-ton) rear dump truck turn swimming pool. 9-10: Pamela Rank amid display of models of GM's Diesel-powered products. Panoramic shot of Motorama. 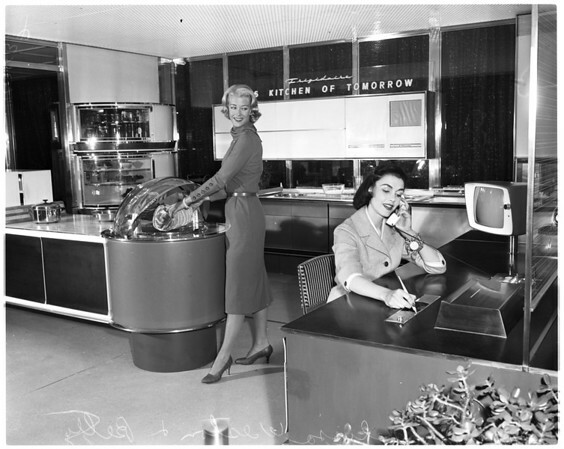 39-40: Melissa Weston and Betty Ellen (cq) in Kitchen of Tomorrow, with TV, built-in vanity and all push-button controlled. 13-14: Peggy Leonard in Cadillac with built-in snack counter, including refrigerator, hot and cold running water, etc. ".